This review is about item#10078503. I have been using it for years. It is not the same thing. I thought that it was outdated, I was replacing it. To me with perspiration, if you are cold outside, you will be worried about cloudiness, it is unnecessary to put a mask on it. Because I think that this can not be helped. It is 95 points in overall evaluation, such as fit, easy-to-view, no intimidating feeling from the other side, cashier's lady was cool. It is convenient because it can be used easily without cloudiness. Even if it is light and takes a long time, there is no burden. However, since the crown of the glasses is long, it will touch the lens part of the glasses when folded. While working in the breast pocket folded and working, the part where the crane hit was whitish and injured. Glasses will be scratched if you do not pay attention to the storage location and method. I thought that it would be nice if there was a cloth or case to protect. This review is about item#10718206. This review is about item#10953494. Use it for approaching work in fine work. Even people who do not use eyeglasses have a feeling of use very nice and very good. 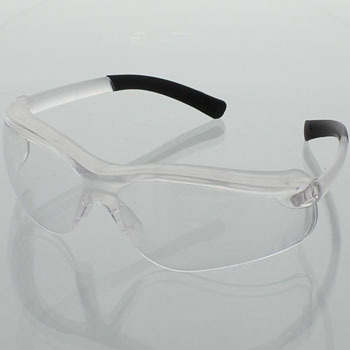 Although I bought many kinds of dustproof glasses until now, it is not a bitter even if it is attached because there is no load because it is exceptional fit due to the rubber of the forehead by the special manufacturer product and it is truly expected. I was not concerned about distortion of important lens as important. I bought both yellow and transparent.